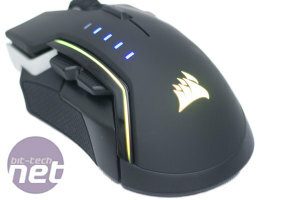 Corsair has been doing very well in recent years, especially in the peripheral market. 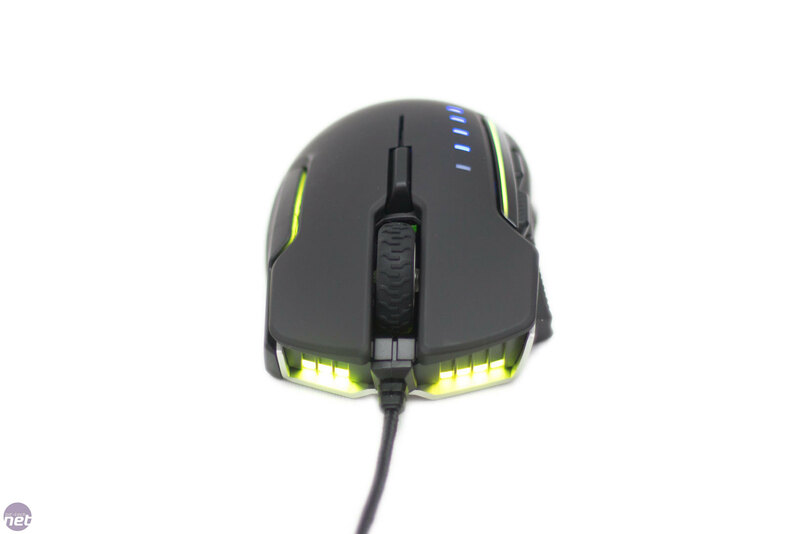 Keyboards such as the K70 Rapidfire and mice such as the M65 have been keeping gamers happy and RGB fans staring at rainbows. 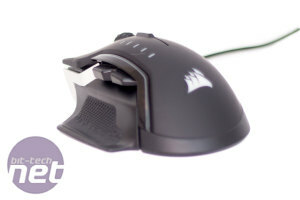 The last mouse that Corsair released was aimed at users with a lower budget, but this time it's aiming at the gaming enthusiast. 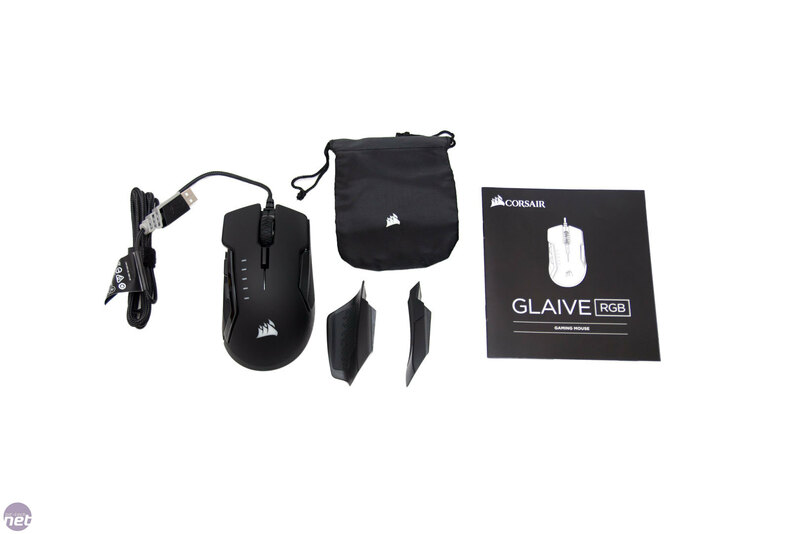 Inside the packaging, there is the mouse, two additional thumb rests, a small bag, and a user guide. 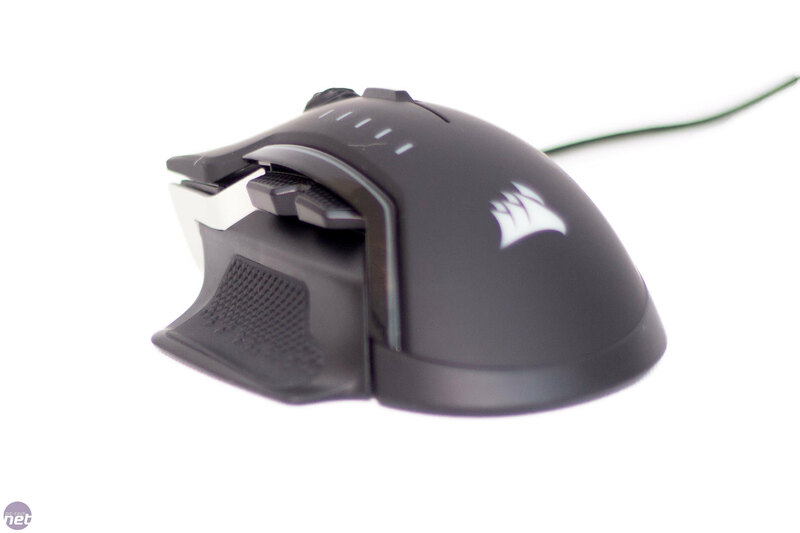 It's nice to see that Corsair has included the little bag to ensure that the additional thumb rests don't get lost in your draw of bits. We will talk about the additional thumb rests later, but first, let's get the usual features out of the way. The Glaive has two thumb buttons on the left-hand side which are easily accessible even with small hands and can be pressed above or from the sides. The right-hand side features a textured rubber grip; this same textured rubber can be found on two of the three thumb rests, so it does tie in nicely. 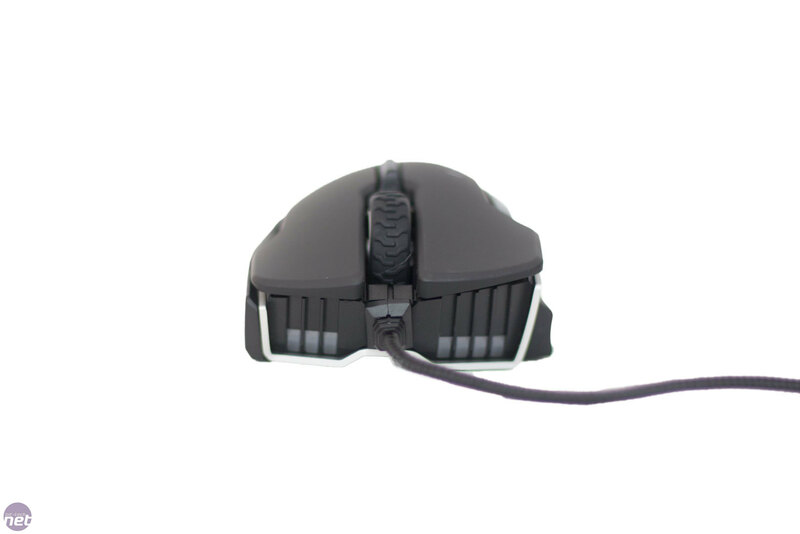 The front of the mouse looks rather aggressive with the vent-like front and the protruding cable. 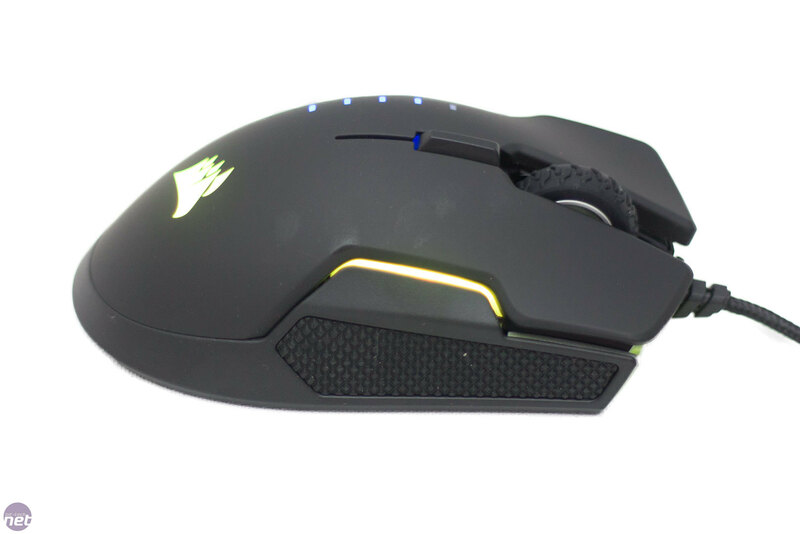 This mouse comes with highlights in either black or aluminium. We chose aluminium, but you can only really see it at the front. 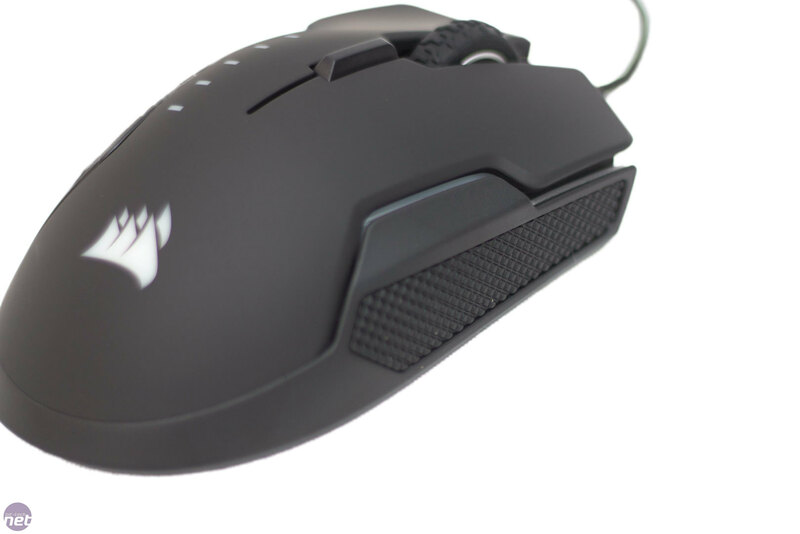 The rear of the mouse is quite bulbous, but it is comfortable. I have small hands, and it fits comfortably in them. 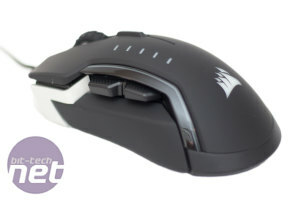 The mouse has a similar rear to the Corsair Scimitar Pro and is covered in a soft-touch material. 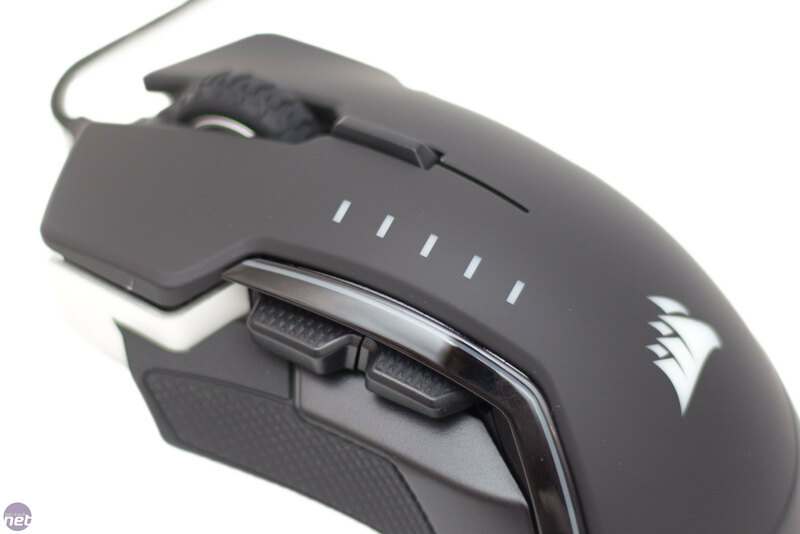 The scroll wheel is made out of aluminium with a thick, textured rubber engulfing it to ensure you can grip it easily. It relatively stiff but not too hard to use. 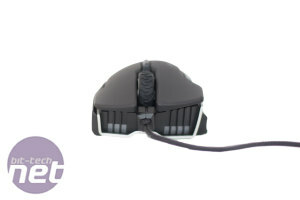 The left and right mouse buttons feature Omron switches rated up to 50 million clicks. These switches feel fine and have a nice, satisfying click to them. 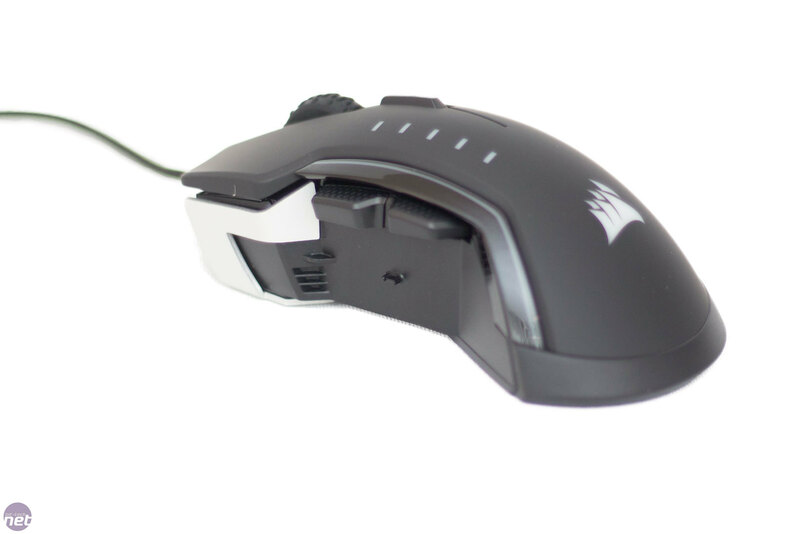 There is a DPI indicator on the top-left of the Glaive. We do have a slight issue here, as the LEDs can be any colour you want... as long as it is blue. 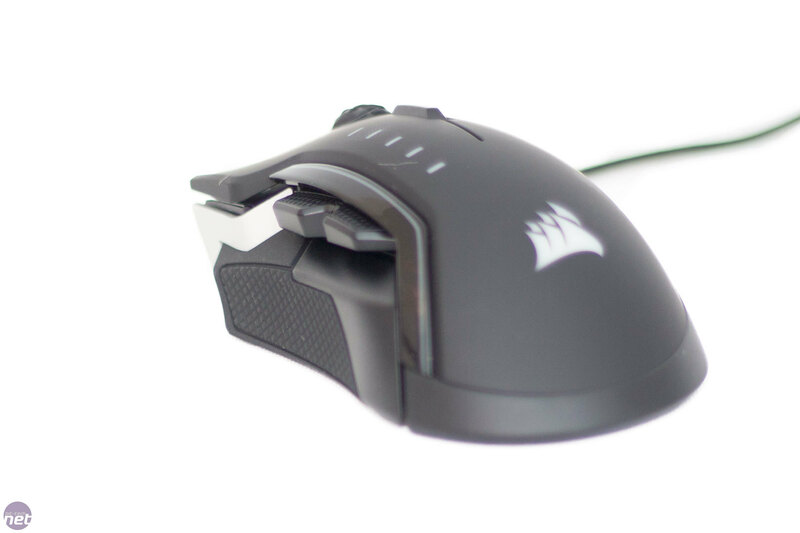 Corsair is well known to RGB everything, so we were surprised that these are locked to a single colour. 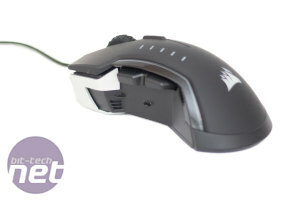 The DPI can be changed by using the DPI button located directly behind the scroll wheel. 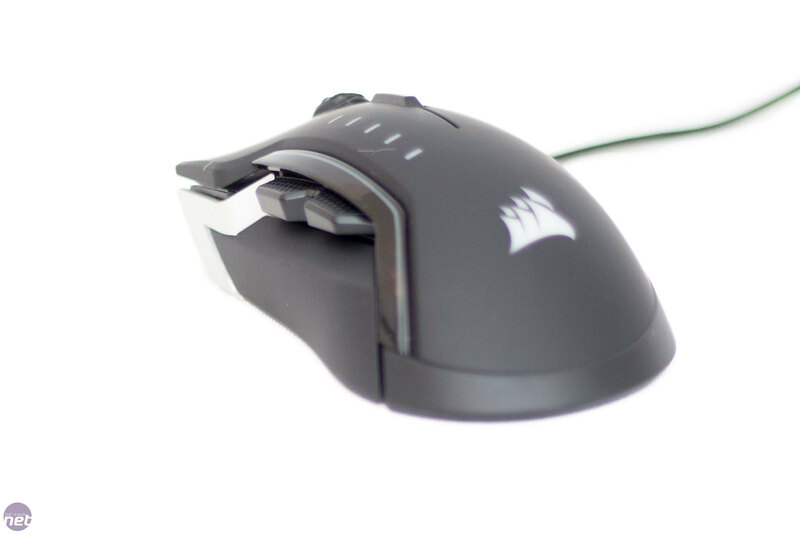 The cable for the Glaive is the same as we usually see with Corsair mice. These cables can fray after a lot of use, but other than potentially looking unsightly, they do not snag. 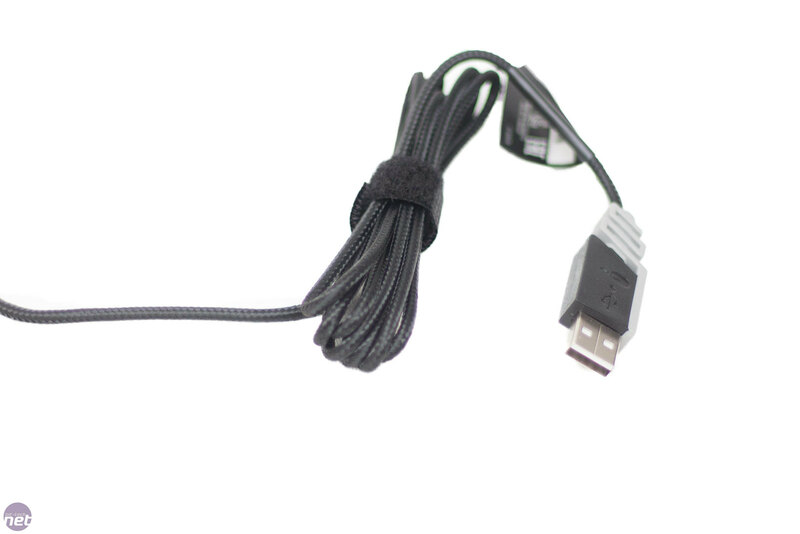 The cable is 1.8m long and has the familiar Corsair USB connector. So, that is the usual stuff out of the way, but this mouse has multiple thumb rests. 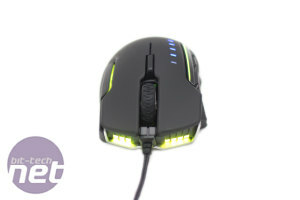 This isn't a new idea; other companies such as G.Skill have done this too. It is quite a good idea, though, as it improves your chances of finding a comfortable grip. The downside is that once you have found which thumb rest you favour, the other two are not needed at all. 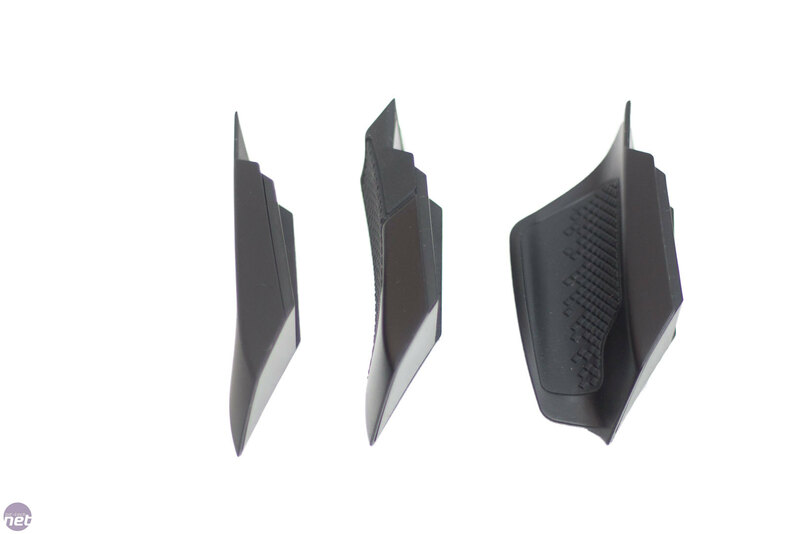 The thumb rests are swappable without the use of tools, and there is a series of locator tabs that ensure that the thumb rest attaches correctly and magnets hold them in place. The largest thumb rest is shown above; this one allows you to rest your whole thumb on it. 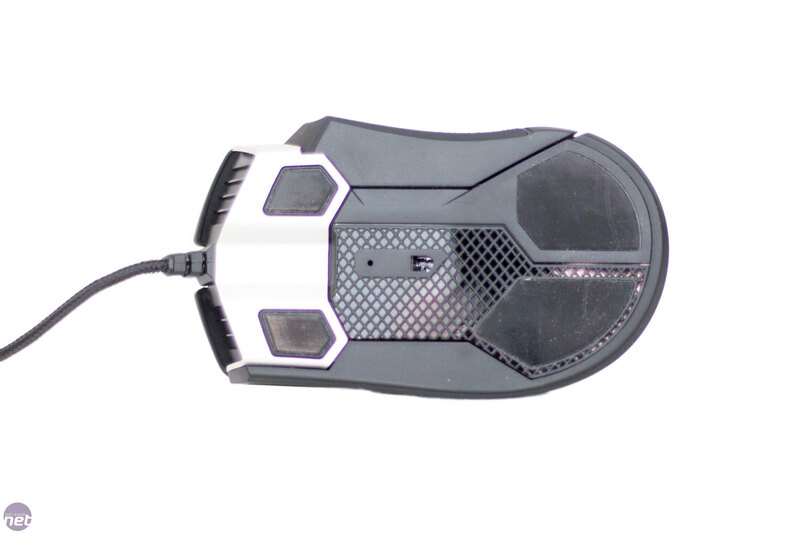 Due to its large size, it actually has its own skate on the bottom to allow it to glide across your gaming surface. The other two thumb rests are very similar but feel totally different when they are in your hand. 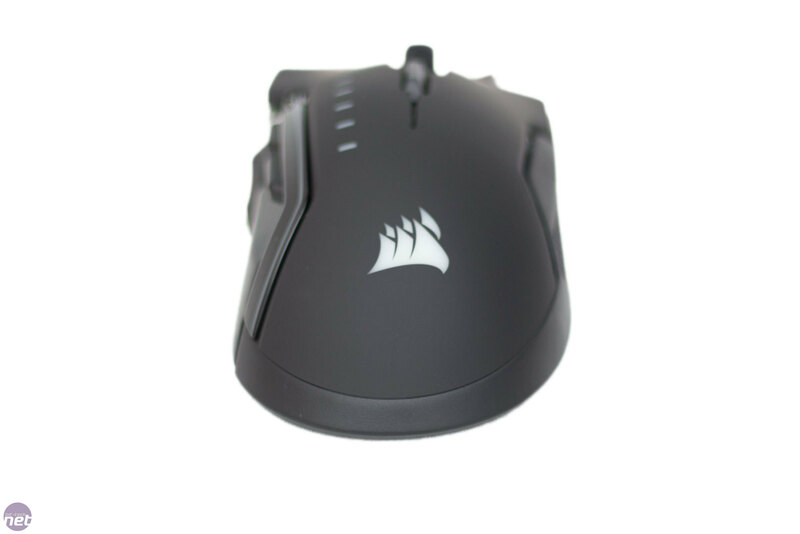 The first is smooth, and the contour goes in the direction of the mouse. The second has the textured rubber like the right-hand side of the mouse and has a contour going away from the mouse. I found myself using the latter the most, and it made for a comfortable experience. Turning the mouse over shows us the four skates on the bottom to allow the mouse to glide. 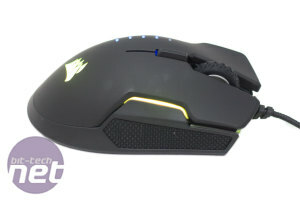 The sensor in the Glaive is a Pixart PMW 3367. 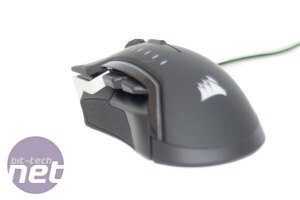 This sensor is a custom sensor that has already been seen in mice such as the Scimitar Ppro and is very similar to the PWM 3366 apart from some small tweaks. 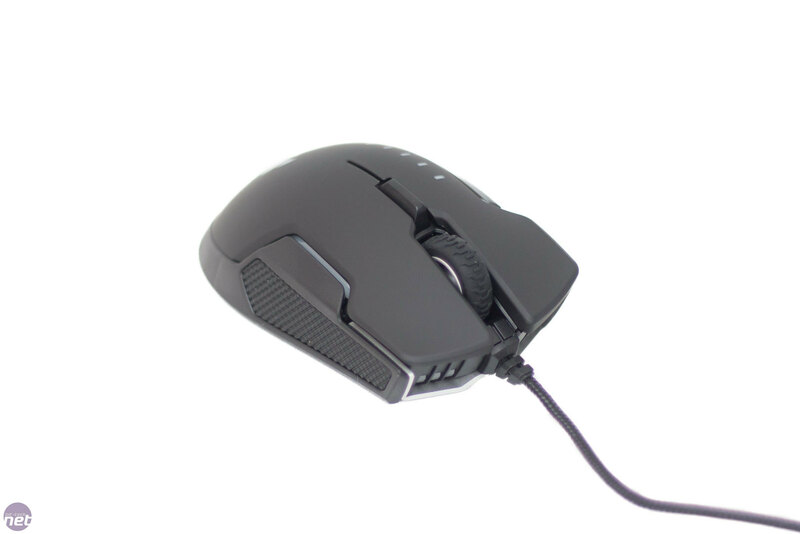 It has a user-adjustable DPI resolution up to its native 16,000 DPI that can be changed in single DPI increments., and you can set five DPI defaults using the software then scroll through these with the DPI button behind the scroll wheel. 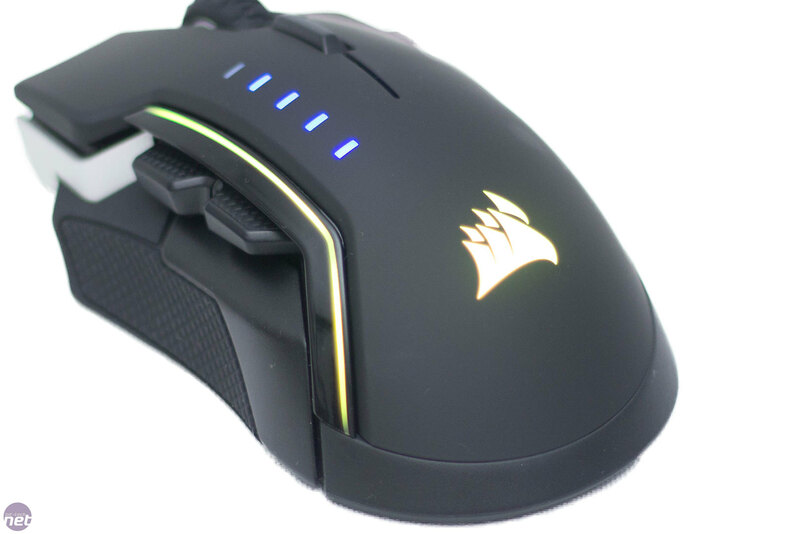 There are three separate RGB lighting zones with the Corsair Glaive RGB. 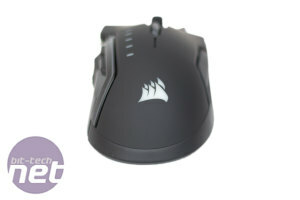 The first is the Corsair logo at the rear, and thee second includes two strips down either side of the mouse. The third lighting zone is my favourite. This is at the front of the mouse, and it reminds me of headlights. 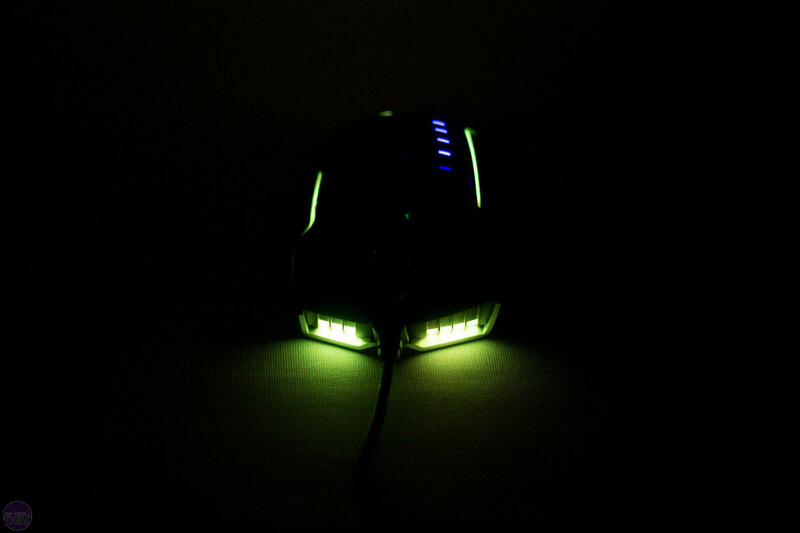 When used in the dark, it gives off a nice little glow. It is completely pointless but fun regardless. All of these zones can be changed independently, can be used to sync with each other, or can be set to sync with your other Corsair hardware. 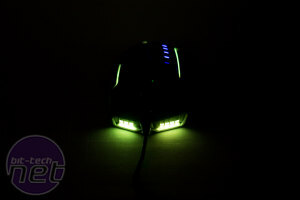 As this is Corsair, these LEDs are RGB (other than the blue DPI indicator).